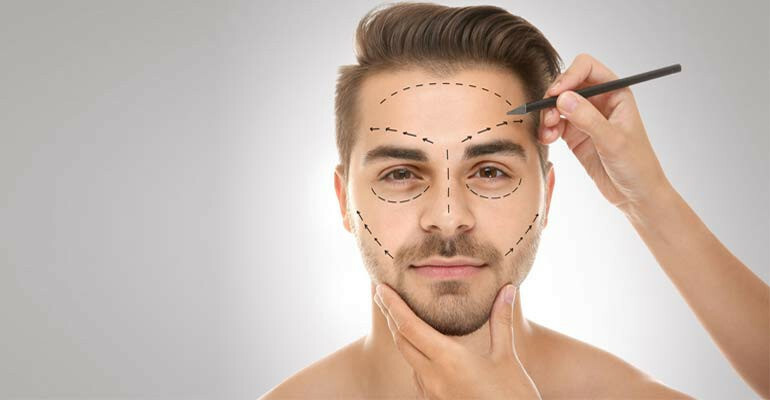 Q: What are the latest trends in Cosmetic surgery for males? A: I see more and more male patients now coming for consultation to reverse early signs of aging like sagging of facial skin, issues of weight gain and hair loss. Earlier, so much awareness was not there. The surprising aspect is that we now have male patients directly coming for consultations on a wide range of things from 6 pack abs etching to penile enhancement. Q: What is the percentage of male patients in your practice? A: Males now make up 30-40% of our consultations and the number has been increasing lately. This could be due to increasing awareness created by print media and social media platforms. It could be due to both increasing awareness and also availability of centres to fulfil these expectations. A: The condition of male breast enlargement is called as Gynaecomastia ( Gynaeco=female like; mastia=breast). This is a combination of fat and gland. Normal male breast has 60% fat and 40% gland. The enlargement can be caused by hormonal surge during puberty, weight gain or as a side-effect of some medications. Q: How common is this condition and how can it be treated? A: Gynaecomastia is a condition seen in around 20% of males usually in their 20s or 30s. This is the age where young males are also more image conscious and sometimes get teased by their peers in the gym or when they go for a swim due to the appearance of their chest. A lot of young males develop an inferiority complex due to this condition. Q: What are the advances in hair restoration? Is hair transplant a better solution than other treatments? A: There are many options for hair regrowth such as medical treatments, RF laser sessions and use of platelet rich plasma ( PRP). Hair transplant is the only most effective solution to baldness. This is now done using a stitchless method called Follicular Unit Extraction. Around 3000 grafts can be transplanted in one sitting. Large areas may need more than one sitting. But medical treatment is needed to stop hair loss from other areas of the scalp. Q: Do lot of male patients come for a nose job? Can a crooked nose be made straight? A: Yes. Quite a few males do come for improving the shape of their nose. The nose looks crooked due a condition called deviated nasal septum (DNS). This causes breathing difficulty in some patients. This can be corrected by a septo-rhinoplasty surgery. So the nose can be made straight also and more attractive also.